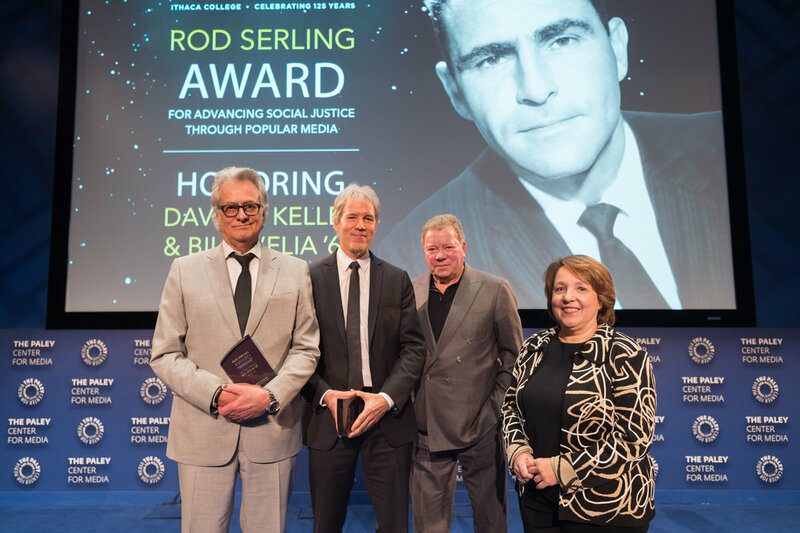 Award-winning television producer/director Bill D’Elia ’69 and producer/writer David E. Kelley received the Rod Serling Award for Advancing Social Justice Through Popular Media on Dec. 7 at The Paley Center for Media in Beverly Hills, California. The award is presented by the Roy H. Park School of Communications at Ithaca College in honor of “Twilight Zone” creator Rod Serling, who taught at Ithaca from 1967-1973. The goal of the Serling Award is to recognize modern media professionals’ work that raises awareness of prejudice, inequality and society’s changing social norms. The award was presented by actor William Shatner, who appeared on two episodes of Serling’s groundbreaking show “The Twilight Zone,” and also starred in “Boston Legal.” The event was emceed by Brian Herzlinger ’97, who credits D’Elia with hiring him into his first industry position, after the pair met at an Ithaca College event. “The partnership between Bill D’Elia as a producer/director and David E Kelley as a producer/writer has yielded decades of prominent television shows such as ‘Ally McBeal,’ ‘The Practice,’ ‘Harry’s Law’ and others that have bravely addressed contemporary issues of social justice, diversity and inclusion,” said Diane Gayeski, dean of the Roy H. Park School of Communications. D’Elia, who was the college’s 2017 commencement speaker, began directing television in 1991, when he helmed several episodes of the Emmy-award winning show, “Northern Exposure.” Over the course of his career, he’s won two Television Academy Honors Awards, and earned eight Emmy and four Golden Globe nominations. He was taught by Serling while at Ithaca College. “It doesn’t go without notice that the arc of my career goes from Rod Serling to David Kelley, two guys that only knew how to write stories that not just entertained, but provoked thought,” said D’Elia. Kelley, who was inducted into the Television Hall of Fame in 2014, has won 10 Emmy awards, and is one of the few screenwriters to have shows air on ABC, NBC, CBS and Fox. Ithaca College currently houses the Rod Serling Archives, a comprehensive collection of his television scripts, film screenplays, stage play scripts, films, unpublished works, awards and other materials. The Park School has one of Serling’s Emmys on display in its lobby.